When most people think of concrete flooring, they think of unfinished basement floors, unevenness, how cold they can be, and how they resemble industrial or warehouse facilities. This though, is not the only thing that can be done when using concrete as your flooring when making an outside patio. Concrete is a material that can be elegant, majestic, and beautiful, if you do it right. There are so many options you have when using concrete, and the benefits to it seem almost endless. While planning your future patio, and how concrete will be infused in your idea, try to keep these things in mind. The biggest thing you will want to figure out before you start this process, is what is going to be the purpose of your patio? Is it going to be a casual family setting? Are you going to want to have elaborate parties, with many of your friends and family over? Will cooking be the main activity on your patio? Or do you want a secluded and private area, just for you and your significant other? These are some things you will need to think through before you start planning your amazing patio that you will use concrete as a main material. Using concrete has many added benefits to it. Here, we will outline the biggest, and best benefits that come with using concrete. First, using concrete is economical. The price is comparison to other materials you could use in place of concrete is much lower than other ways. Many contractors work with this Houston concrete plant for that very reason. It is also not expensive to paint, or polish your concrete floor. When you polish concrete, it gets this majestic and almost rustic look to it. This will certainly add a flair to your outdoor living center, and will for sure be a talking piece during get togethers, with friends and families. The next benefit, which owners of concrete love, is how easy it is to care for concrete flooring. It does not take much maintenance, which would include sweeping and mopping it about once a week to keep it in its best appearance. IF you polish your floor, or are considering to do so, this can do done every handful of years, with certain factors delegating that. It is highly recommended when installing concrete floors to add a baseboard. This is so when cleaning, little particles and dirty mop residues does not get stuck in the cracks. 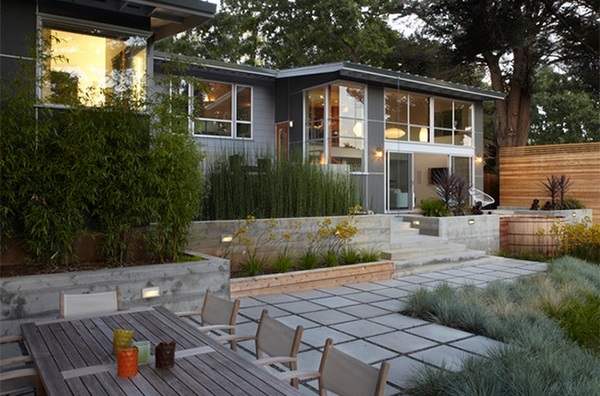 Sustainability with concerns to concrete floors is also a favorite benefit of equipping your outdoor area with concrete floors. Even if you already have an existing concrete slab and wish to put in a new one, for a better and newer look, this is not needed. All you need to do is simply, sand down your concrete floor, polished it, and then sealed it, your concrete floor will be looking like you had just put it in, and this will also save you a good deal of money as well. These are just three of the main benefits to using concrete flooring in your outdoor patio area. Now we will talk about planning your outdoor living area. When planning, you want to envision just how big you would like it to be, as well as what its shape will be exactly. People tend to underestimate the size that they will need. You want to keep in mind, how many people you plan to be able to enjoy this space at one time. How many chairs and tables do you want? Is there going to be a grill, fireplace, music system? You always want to make sure you put aside enough space to be abler to have a comfortable lay out. There are no tricks of the trade, or golden rule for sizing your patio, but generally, if you can, you will want to make it about as wide and your house, and make it as tall is your house is long. What makes it even better is concrete’s durability. To be match the flow and design of your house, you are going to want to pick building materials that show off and compliment your house pleasantly. Nature materially, or arterial materials that look nature are always a hit, but they tend to be a little pricier then conventional materials. Greenery and plants are a beautiful addition to an outside area, smell amazing, and give it that natural look. You have to be honest with yourself though, are you a low maintenance person, or do you have a green thumb? Don’t get hung up on landscaping around your patio. Do the hardscaping first, and if necessary, you can always add to your landscape as time goes on. Greenery compliments almost any patio, and it is a great idea to break up sections of your concrete patio with flowers and plants, dispersed throughout. You can either remove some sections of concrete be jacking hammering them out. If this is not possible though, try to add as many potted plants as possible, without going overboard, and making your patio look constricted. There are many things to consider when planning an outdoor concrete patio. The biggest thing to remember is that one want to think all aspects through accordingly and thoroughly, because once it is there, your concrete patio will be a handful, and can be costly, to remove and replace it.